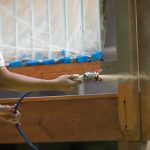 If you are a homeowner that desires to embark on a huge painting project, you can happily replace your brushes and rollers with a paint sprayer in order to save money by doing it yourself as well as save time with less energy. This is undoubtedly the best solution to all your painting struggles. Also, paint sprayers can make an entire host of renovation tasks easier. With Graco Magnum X5, DIY homeowners and handymen are assured of cost-efficient and excellent performance. This paint sprayer is suitable for painting all kinds of interior projects such as siding, fences, decks and small houses. Also, the unit has a unique set of features and achieves well with several materials. Magnum 262800 X5 is a model that is highly regarded. Choose X5 when you paint on a quarterly basis. If small painting tasks within the house are your priorities, this device is the best choice for you. Read on to know more about Graco X5 in our complete review below. 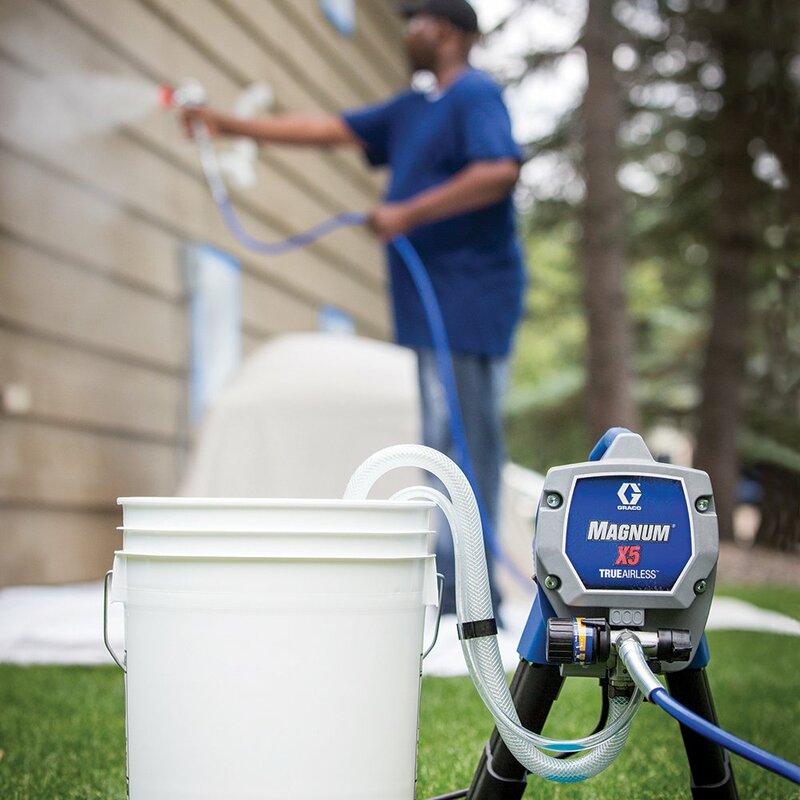 The Magnum X5 is a paint sprayer that is well designed with a metal SG2 gun for spraying large surfaces like sheds, fences, garages and walls. The X5 gun comes with a sturdy full trigger that works with tips up to 0.015″. 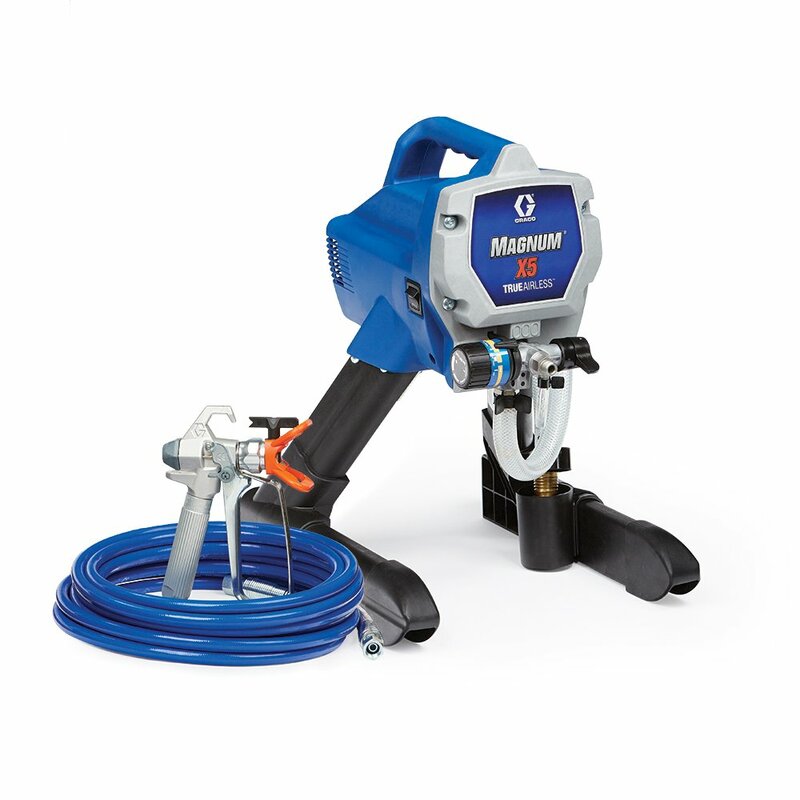 Users will be able to pump out 0.27 gallons of paint per minute when combined with a 515 RAC IV tip. The adjustable intake tube allows you to work with 1 to 5-gallon bucket to save you the time of refilling regularly. The paint sprayer comes with 25 feet of DuraFlex hose connected to the spraying gun through the central. With this hose, you’ll spend less time moving around while painting. It can contain additional hose of about 70 feet should you’ll paint a tall fence or wall without altering finish quality. Graco X5 is a project model and annual recommended usage is 125 gallons. There is full assurance that this device is more than capable to flawlessly handle several types of tasks within normal size house. X5 is an airless sprayer suitable for handling light contracting jobs. The 1/2 horsepower motor of the Magnum 262800 X5 produces about 3000 PSI of pressure which can aid you to tackle your home projects. Its initial setup is simple and has an instructional manual attached to it. Machine features Stainless Steel Piston Pump – This sturdy piston pump delivers high-pressure power to spray un-thinned materials producing a professional result. When you disposed to several models of paint sprayers available on the market, it’s always tedious to be convinced of the right one for you. Even Graco as a brand still has several models which can also be tricky to pick your best suit. Hose can be extended to 75 feet making users access tall walls or fences easily. The stainless steel pump which aids the machine last for several years’ worth of tasks. Flexible controls offer you the ability to paint to your desire. This makes you take total control over the finish of your task. Reversible tip and filter help avoid clogs and make them simple to eliminate. This machine is capable of working perfectly with other tips when the need of different size arises. Sprayer is lightweight and simple to convey. The sturdy stand keeps the unit stable when in usage. Easy clean function can be used with your garden hose. Now cleaning is just as easy as painting. The sprayer is simple to set up and operates both for professionals and beginners. It is relatively cheap when compared to similar ones in the same range. Follow Sprayer Safety Precautions: Firstly, take note of the safety precautions. For instance, wear protective measures for both body and eyes. When in doubt, refer to safety measures for the spray equipment. Appropriate Surface Preparation: Use TSP (Trisodium Phosphate) in washing any interior walls and let it dry while you use a pressure washer and a cleaning solution for exteriors. As soon as the surfaces are clean and dry, patch-up chips, cracks, and holes, and sand any coarse areas. While spraying either interior or exterior, cover your furniture and plants respectively. Proper Spray Technique: Keep spray gun at about 12 inches away from the surface. For quality coverage, use a long and unbroken motion. Overlay your spray pattern by 50 percent. Graco X5 airless paint sprayer can be the best choice for you when it comes to household tasks that will need you to cover large surfaces. It is also suitable for light projects. This machine does not require you buying several accessories to set it up. X5 will no doubt light up your tasks with convenience. This machine is highly recommendable due to its lightness, ease of operation versatility and features other brands or similar sprayers do not guarantee. The unit is affordable and holds its worth as well as helping you completes household tasks efficiently within a short space of time.